Home #JapaneseGP 2017 RACE Valentino Rossi #JapaneseGP Rossi crashed out !! 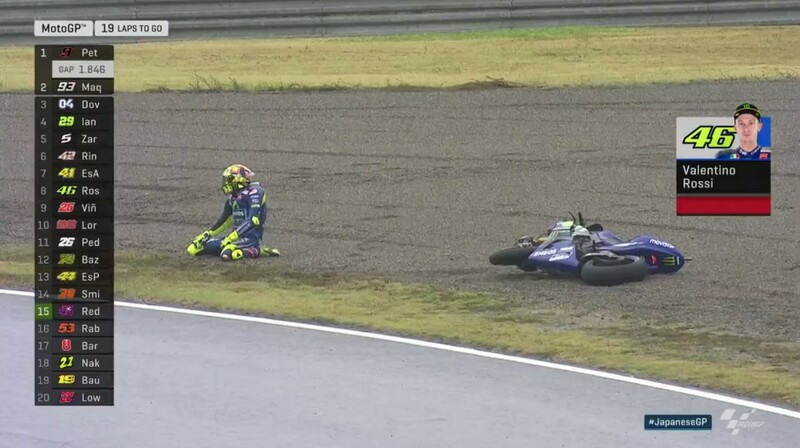 #JapaneseGP Rossi crashed out !! Stop the Struggle at Motegi, Valentino Rossi Falls on the Corner 8.In the extreme rainy conditions, Rossi tried very hard to push forward but ended up crashing in the Race. 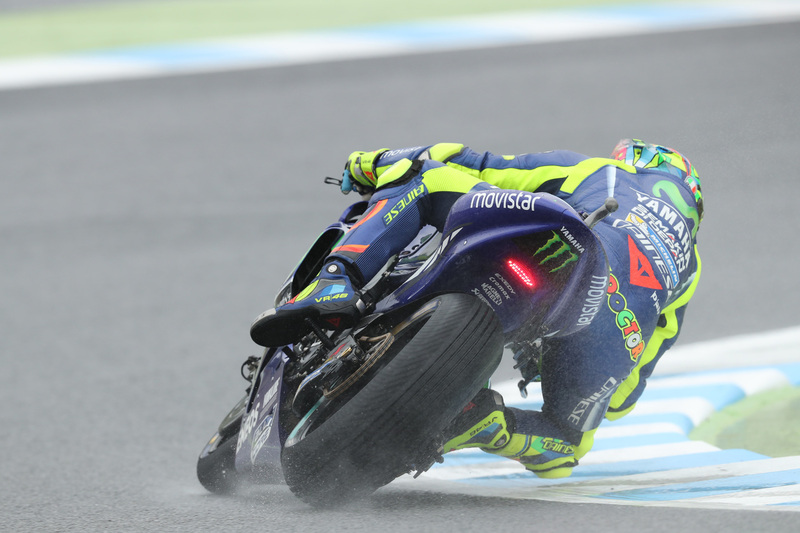 MOTEGI - Yamaha Movistar's flagship rider, Valentino Rossi, suffered bad luck on the mat of MotoGP Japan 2017. Drove at Motegi Circuit, The Doctor must be desperate to seize the podium of the series to-15. Italian racing star fell at the corner of eight Motegi when the race remaining 19 laps again. Must retire early, Rossi at the same time eliminate the golden opportunity to seize the highest point at the end of this season. Valentino Rossi failed to continue the race at the Grand Prix Japan, after falling on lap 19, Sunday (15/10/2017). The Yamaha Movistar team racer lost control when he was going to conquer the corner. The drivers are forced to fight hard conquer Twin Ring Motegi Circuit. Understandably, the 4.8 km trajectory is in very wet conditions, allowing drivers to lose balance. This is what Rossi felt. The Doctor's appearance on this 15th series race is actually not so bad. Starting the race from 12th position, the seven-time world champion successfully improved his position to ninth. Unfortunately, after successfully overtaking Jorge Lorenzo, Rossi fell and he looked upset because failed to complete the race. Before owner number 46, there are some drivers who slip off the track. Call it, Cal Crutchlow. Until this news was revealed, Petrucci managed to maintain its position as the leading rider. while Marquez and Dovizioso continue to struggle to steal the Italian racer's position.